In the first of what are promised to be regular press briefings, Alexander Dennis Ltd (ADL) invited the press to its Scottish facilities at Larbert and Falkirk last week for an update on what has been happening within the company since their last press conference at the NEC in November 2015. Stuart Jones went along to hear CEO, Colin Robertson and senior members of his team talk openly about their aims and achievements. As anticipated, ADL achieved record turnover figures in 2015 of £602m, up £101m on the 2014 figure of £501m and the £499m of 2013. Profit was up too with a record after tax result of £18.5m and an improved operating margin of 4.2%. 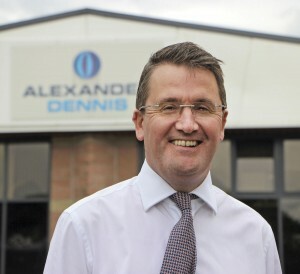 These figures came on the back of ADL achieving its highest ever sales volumes, producing a combined total of 2,700 vehicles and kits, of which 1,228 were for the home market where single deck sales had been particularly strong, driven by DDA deadlines. It was a recurring theme of Colin’s that while ADL sought to continue growing international sales, it was of fundamental importance that it retained its UK customers and the way to do this was by giving them ‘cracking’ products and the best aftermarket support. Looking at the UK, 2015 was the fifth successive year that ADL was number one in the market and had a share of over 40%. 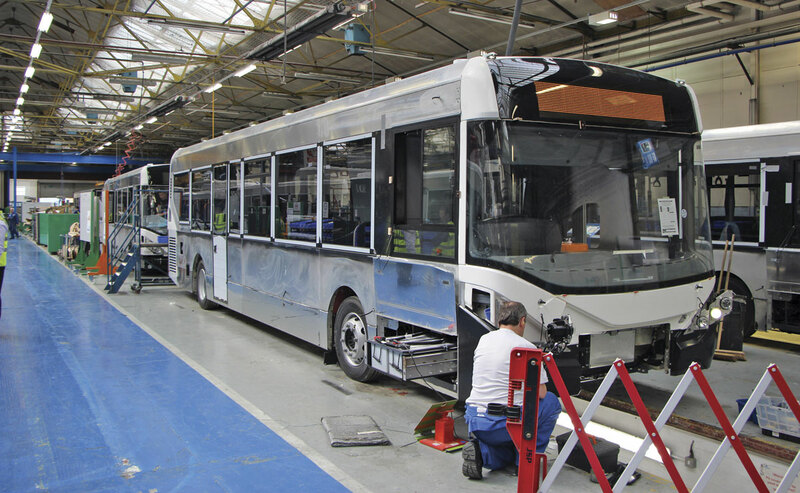 In a market that rose by 432 buses overall to 2,895 units, the 1,228 ADL chassis registered represented 42% of all buses sold. It was an increase of 132 on the 2014 total of 1,096 and put ADL 12% clear of its nearest rival (Wrightbus on 30%) in market share terms. In the year to date, the gap appears to be widening as the overall registrations achieved by ADL have risen to 44% (433 buses) with Wrightbus second on 29% (283 buses). ADL leads both the single and double deck sectors with a 57% share of the midibus market and a 40% share of the double deck market. In the coach market so far this year there have been 480 registrations, of which 10% have Plaxton bodies. Volvo is the leading chassis/underframe provider with 29% of the market. These figures exclude 33 Crown registered Plaxton bodied coaches. 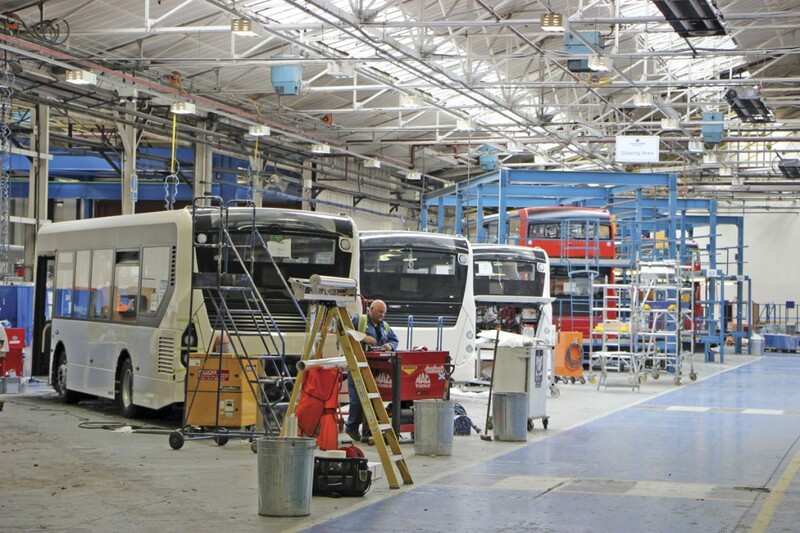 The big development going forward is the new relationship with BYD which will shortly see 51 12m Enviro200s on BYD chassis delivered to Go-Ahead London. They will deploy them on the Red Arrow services, 507 and 521 from Waterloo depot where the necessary charging infrastructure is in the process of being installed. Isbrand Ho, MD of BYD Europe, indicated there was a second ADL/BYD product in the offing and this is believed to be a 10.8m single decker, though in the longer term a double decker has to be distinctly likely. My understanding is that, rather than BYD supplying chassis, there will be a switch over in the relationship to ADL integrating key components supplied by BYD. 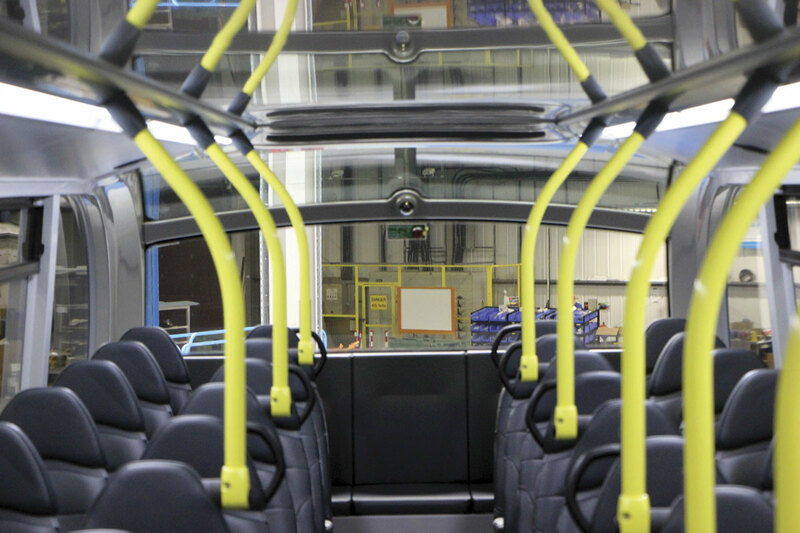 ADL did not intend that the MMC designation should be anything other than an internal reference code for the latest generation Enviro200 and 400, but so many operators were involved in the project that they have become primarily known by the title. 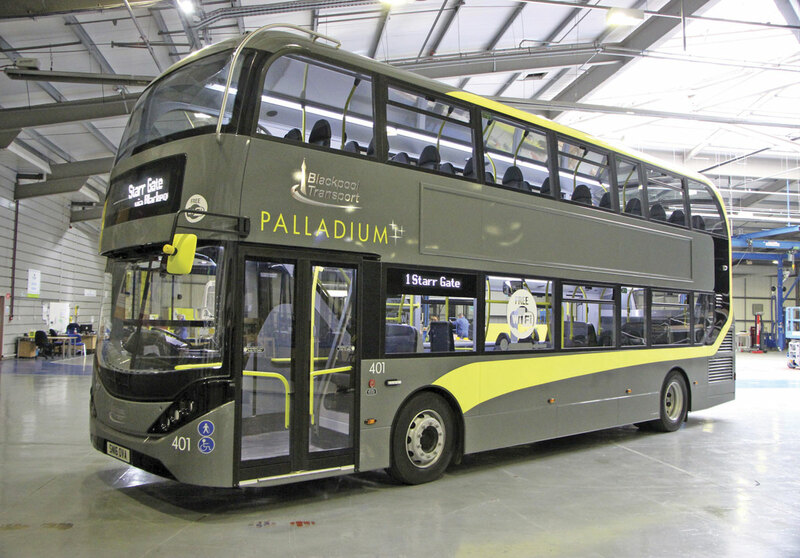 A version of the MMC, the Enviro400H City was unveiled at the NEC last November and there are now approaching 100 delivered or on order. It features enhanced styling both externally and internally including a rear dome window that makes the interior much lighter and brighter. Having ordered the first 19 vehicles, Arriva has placed a further £11m order for 34 similar buses which ADL sees as an endorsement of the City specification and the performance of the first batch. Although partly intended as an option that London operators can choose to provide similar levels of appeal to the Borismaster, it was never ADL’s intention that the City would be a London only bus because they believed it had just as much potential for provincial use. Orders from outside London have already been taken among the 100 taken or promised for the City, among them one from Blackpool Transport for ten buses in what is planned to be a long term alliance between the two businesses. The MMC family is selling very well, indeed I was surprised to learn that there are already 1,107 delivered and registered of which 774 are Enviro400 (including City) and 333 are Enviro200. These figures include MMCs on Volvo hybrid chassis and CNG powered Scanias. Looking forward, orders are placed or in build for a further 854 MMC variants, split roughly two to one in favour of double decks, taking the total count to approaching 2,000 units since the launch. 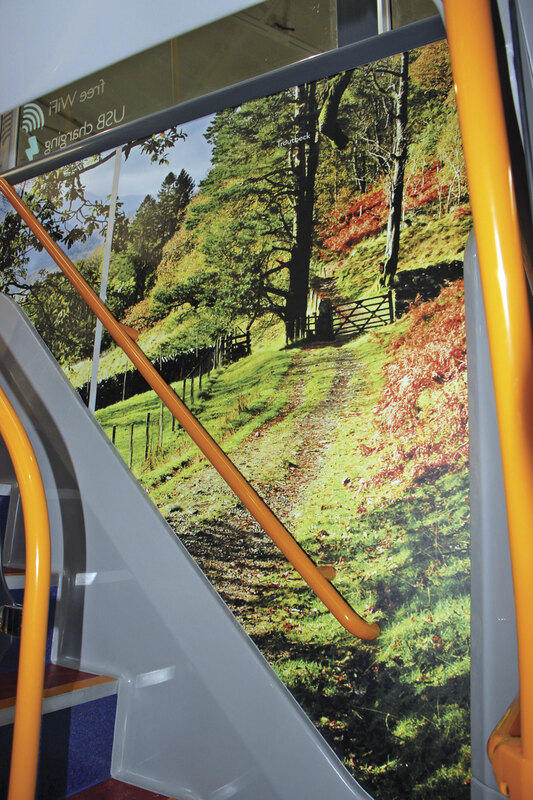 A new aspect of ADL’s offering is its willingness to work with customers on livery, ‘immersive branding’ and interior specification, suggesting alternative colours and materials, in order to maximise the product’s appeal to customers. The Blackpool Enviro400 City vehicles are an example of this. Matching the enhanced expectations of customers, it can offer not only USB and Wi-Fi (which could easily become standard, such is the demand for them) but is also looking at what possibilities there are with social seating, realtime information systems and Netflix movie streaming. There are new options too, among them the availability of the Fluid Master system, which monitors all fluids on board and informs of any topping up required. Indicating levels automatically in this way reduces the time required for routine checks and prevents wasteful overfilling. The bulk of the increased turnover in 2015 (95%) came from growth in the amount of international business won. This accounted for £261m of revenue, up from £166m in 2014 and a whopping ten times the £26m of 2009. Crucial to ADL’s ability to deliver this has been the establishment of joint ventures, alliances and overseas manufacturing locations taking advantage of the localisation of supply chains, procurement and operations. 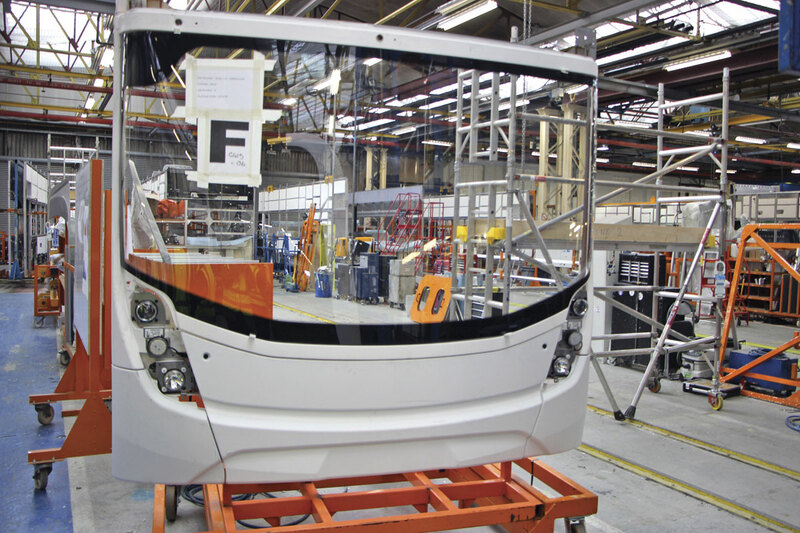 In addition to the manufacturing facilities in Guildford, Falkirk/Larbert and Scarborough, ADL buses are being built all over the world. 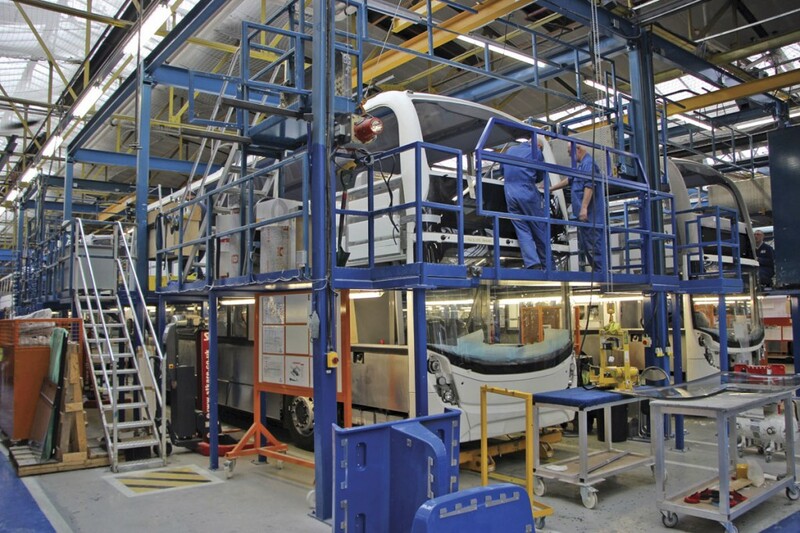 ADL has an operation in New Zealand where it is working with Kiwi Bus Builders to produce buses ‘Made in New Zealand’. Initial business involved the supply of Enviro200s but an order from Auckland has now been taken for 38 tri-axle Enviro500s which have required special dispensation. North America is a market that has been cultivated for a long time and has become a core part of the sales strategy. In the USA, midibuses are produced in partnership with New Flyer at St Cloud in Minnesota and there is a chassis and body assembly partnership with ABC at Nappanee in Indiana. In Toronto, Canada, ADL has established its own body manufacturing facility reflecting the acceptance it is finding in the Canadian market. Driving new sales is the newly developed SuperLo version of the Enviro500, 253 firm orders with options to 403 of which have been ordered by Metrolinx in Toronto, which the engineering department has managed to bring in at only 3.91m high and which is believed to have considerable potential with East Coast municipal operators. In the Far East, ADL has its own operations, Alexander Dennis (Asia Pacific) Ltd, in both Singapore and Malaysia. In China, it has a bodybuilding partnership with Zhuhai Granton Bus & Coach who produce bodies on chassis built in Malaysia. The facility has been turning out 24 buses a week during 2015. Hong Kong was the market in which both Dennis and Alexander, originally separately, first won large scale repeat overseas business. The cycle of replacement was always going to peak in 2015 as it is 18 years after the massive vehicle buying programme that accompanied the opening of the new airport there. ADL managed to win over 80% of the orders available delivering over 1,000 during the year. Singapore has a new competitive tendering regime which is changing the nature of the market there and plans to invest in buses. Over 200 buses have been purchased in the last 18 months. 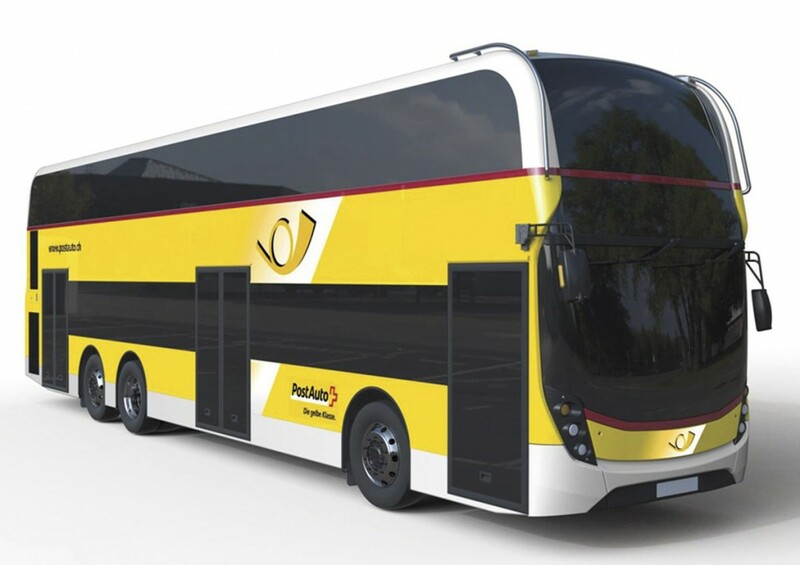 With the country looking to use double decks rather than artics for its high capacity requirements ADL has been looking to refine the Enviro500 product to suit, sending a demonstration Concept Bus to gauge customer acceptance, an exercise that has attracted a positive reaction. The bus is a three door, two staircase Enviro500 with a number of enhancements including Wi-Fi, USB points at every seat and high back contoured seats. In Malaysia, where there is a requirement that anything sold be built locally, ADL has manufacturing partnerships with Deftech, TMA subsidiary Sime Darby and Scomi. The longest established is that with Deftech. Many readers will be surprised to learn that ADL built more chassis in Malaysia than in Guildford last year. On the sales front, Prasarana ordered 120 units for Kuala Lumpur of which 80 are Enviro200s and 40 are Enviro500s. Orders placed in Mexico call for 90 E500s for Mexico City which are scheduled to go into service in mid 2017. These 12.9m long buses carry 130 passengers. In demonstrations of the product 80% of passengers rated the experience at between eight and ten out of ten and 92% were keen to see such buses on the roads of Mexico. One hopes that the Brexit decision does not have a detrimental effect on ADL’s ambitions in Europe. An office has been established in Berlin where an Enviro500 has been demonstrated and the team is engaging with potential customers. Scheduled for delivery in January are Enviro500s for Swiss Post Auto. ADL has been investing in people to help develop its global ambitions and one clear sign of this was that we were joined by Stefan Baguette, who was with the Polish manufacturer, Solaris, when I first met him, but has been in the role of Group Market Analyst with ADL for around a month now. 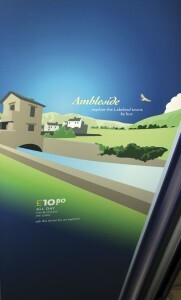 He is based at Larbert. Giving some idea of how important he thinks customer service is, Colin Robertson said that there are only two meetings that it is compulsory for his senior managers to attend. The first is finance, because that is the pulse of the business, and the second is customer service because that is the heart rate, and you are dead without either. (Ed: I know pulse and heart rate are the same thing but that is the point.) He said the approach was based on doing the right thing and collecting and really using the data available. On a daily basis, Colin personally monitors aftermarket indicators, particularly VOR status, on a country, product, customer and garage basis. The company currently achieves an average 90% response within 24 hours on VOR attendance, a statistic that includes weekends, together with an average 80% record on return to service within 48 hours. Parts availability was also over 99%. He admitted he was cautious about how much to reveal to us on what was being done because he saw the level of service ADL now provided as one of its competitive advantages. Group Quality and Customer Service Director, George McAdam, who has worked with CEO, Colin Robertson, for all of his working life, explained more about ADL’s commitment to customer service and the way in which it is tailored to bespoke customer and market needs. He reiterated the points Colin had made earlier about the importance of aftermarket support. On service support, there were regional service managers and service engineers in all territories in line with the local model types, vehicle numbers and geography. In every region there were fully equipped service vans with full diagnostic capabilities, support was provided at operators’ depots and there were service level agreements with all power train suppliers. In designing the MMC range and other new products, ADL had tried to simplify things in order that it was not necessary to remove units to be able to get at others for servicing. Existing vehicles were monitored, and if a potential improvement was identified, it was implemented and future vehicles were built with it as standard. All key systems were subject to supplier sign off and installation and when new variants were introduced, special attention was paid to their early performance to ensure that nothing unforeseen cropped up. Further helping to ensure uptime and reliability will be a new product ADL is developing and currently trialling called AD-Connect. This is an integrated onboard monitoring system, connected to ADL, that enables constant remote checking of a vehicle’s functions in order that the operator can be informed when there is an issue that needs addressing. It could potentially mean an end to traditional set service intervals to be replaced with a needs based system. A big part of ensuring that ADL staff have the necessary skills and their customers know how to look after the vehicles properly is the ADL Training School, which was launched in 2008. The training operation is split between dedicated facilities at Skelmersdale and Guildford, employing its own team of specialists. It offers bespoke training courses that can flexibly meet trainees’ needs, provided by an independently accredited ISO registered company. In addition, on-line training aids have been developed. To date, over 6,000 service engineers have graduated from its courses. ADL has a full apprentice training programme and we met some of those participating in it at the Falkirk plant. They welcomed the opportunity to learn skills and start earning money and saw it as a good alternative to university or college. ‘If you just go to University, you don’t get the experience’ one of them commented. Aftermarket support is a hugely important part of the story but you still have to have the right products to do the job and attract customers in the first place. In an update on engineering aspects of the business, Group Engineering Director, Ken Scott, emphasised the continuing commitment to improving fuel economy and also to trying new driveline technologies to meet the aspirations of customer, transport authority and city requirements. 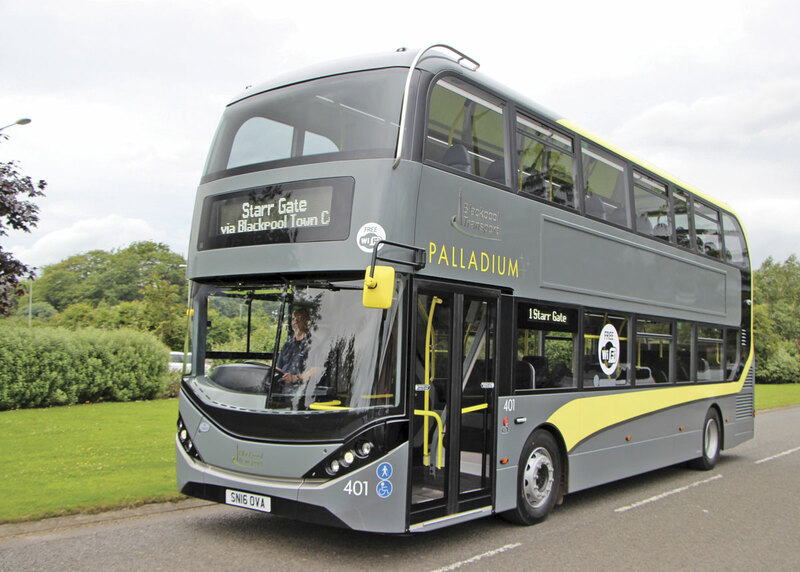 He listed no less than seven new models that had been introduced to the market in the preceding 12 months: Enviro200 LCEB; Enviro400 LCEB; Enviro400H City; Enviro400H Virtual Electric; Plaxton Cheetah XL; New Zealand specification Enviro500 and Enviro500 Hong Kong Facelift. He then went on to list seven more that have taken or will take to the road in 2016. On this second list were: the low height Enviro400 for Hong Kong (deliveries of which will commence in December); the three door Enviro500 for PostAuto; the Enviro500 SuperLo; the Enviro400 with City styling; the Scania CNG bodied Enviro400; the Enviro500 for Mexico and the Enviro200 BYD full electric. On the driveline front, in addition to diesel, ADL offered or would offer: diesels with supplementary technologies such as electric cooling; low cost hybrids; full hybrid; virtual electric and full electric. As well as the electric route, operators could opt for CNG engines that produced 80% less CO2 than diesels. The project ADL was working on in conjunction with Scania would deliver the world’s first flat floor CNG fuelled Euro6 double decker. It features a five-cylinder Scania 9.3-litre engine developing 280hp and torque of 1,350Nm. 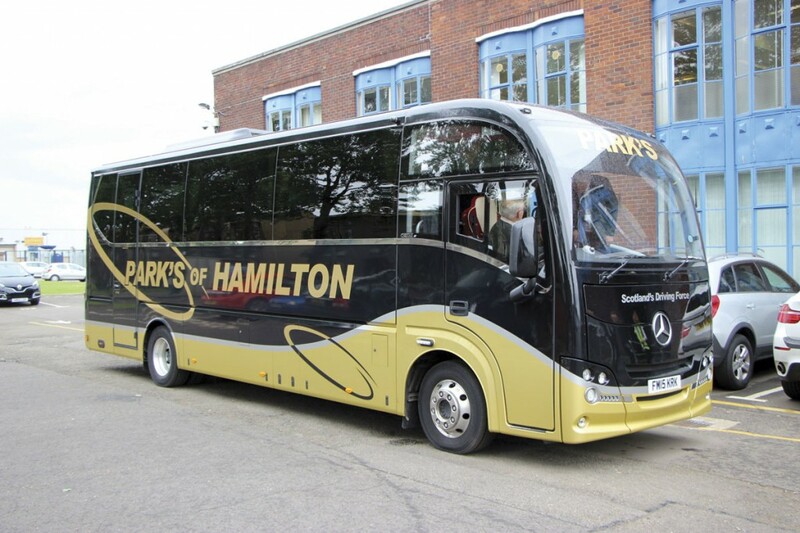 After the presentations at Larbert we were shown one of the ten Enviro400 MMC Citys ordered by Blackpool Transport before travelling on it to Falkirk for a tour of the production facilities. Falkirk Operations Director, Peter McAllister, led the tour, explaining that Falkirk employs 762 people in total, of whom 532 build the buses. There would normally be five lines in operation but a sixth has recently been added so that there are four double deck and two single deck lines. He explained the manufacturing process to us, beginning with the chassis preparation and the addition of the GRP sections. 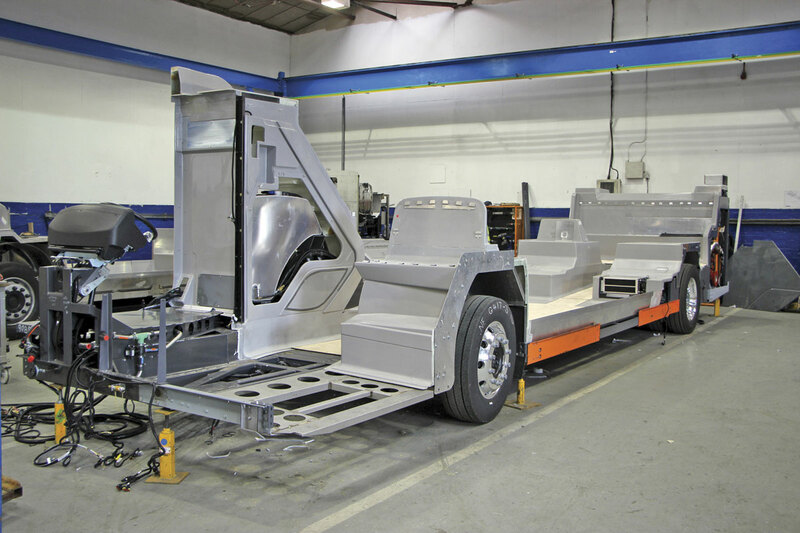 Looking at an Enviro double deck chassis alongside a Scania chassis (destined for the Cambridge Busway) it is clear how much simpler and easier to body the Enviro is. Recent investment has seen a crane installed to assist in adding the large GRP sub assemblies to the chassis. This has not only made the job easier, it has resulted in an 81% drop in annual reportable incidents resulting in injuries at the plant, from 22 to three. With the GRP already in place, the Enviros go to the lines where they fitted with their side sections, composite roof with all harnesses and trim already in place, front section complete with screen and light units and other key structural elements which have been built off site by contractors. Over recent years and in particular with the introduction of the MMC, there has been a deliberate process of deskilling the build process and reducing the amount of skilled coachbuilding required, ensuring consistently high build quality. Once the framing stages are complete the bus continues down the lines having the rest of the body installed and after ten days the complete structure is PDI’d. It then spends two or three days in paint, depending on the complexity of the scheme, and five days in finishing. The entire build process is complete in between 18-20 days. 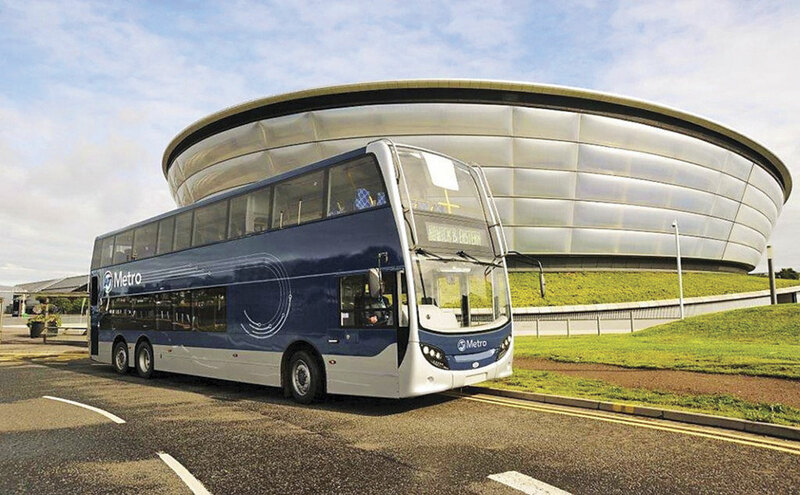 There are currently no Euro5 vehicles in build at Falkirk (though there are a number of stock Euro5 Enviro200s in the yard at Larbert), the factory is on annual shutdown for the first two weeks in July and it could well be that if, as they anticipate, the UK outlaws the registration of vehicles with Euro5 emission levels and earlier from 1 November, there will be no more produced at Falkirk. 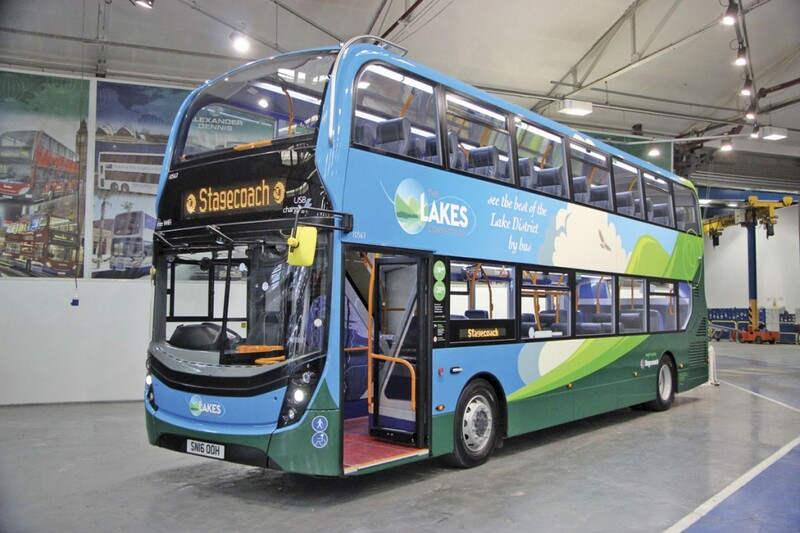 One of the highlights of the tour was the chance to have a look at one of the new E400 MMCs that Stagecoach in Cumbria is putting into service on ‘The Lakes Connection’. This featured exterior and interior design attention from Ray Stenning, including leather seats and an idea I’ve not seen before, forward facing promotional messages and graphics on the flat undersides of the ceiling down both sides of both decks of the saloon (rather than on the coves), where seated passengers can see them without craning their necks. 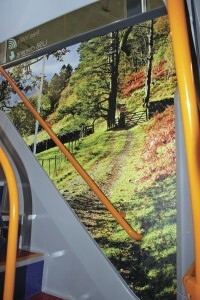 Each bus in the batch has a staircase mural depicting a different natural attraction, in this case Troutbeck. The exterior treatment is in shades of green and is very eyecatching.